Is this your home before moving? Stressed out about it? At some point, you’ll wish you could stuff your anxiety into a box, tape it up and place it on the truck. That’s not going to happen. These tips won’t stop the moving day butterflies in your stomach, but they will make them dance in choreographed formation. Click the “Read More” link below or our title above to see our 10 tips. 1. Engage in positive self talk, and realize that the stress that accompanies moving day is the stress that accompanies any type of change. Ultimately, change is a good thing. Without change, there’s boredom, and boredom leads to complacency. In the weeks leading up to the big day, spend some time visualizing what your life will be like in your new location. Fantasize about how you will decorate your new home, the activities you’ll enjoy and the new friends you will make. 2. Pack and label your boxes ahead of time. Ambivalence about a move causes procrastination, which triggers more stress. 3. Create a moving day playlist for your packing pleasure. Movieline has some excellent suggestions. 4. Go out to eat. Chaotic environments interfere with digestion, and indigestion increases stress. Enjoy some comfort food in the North End, or seafood in one of the clam shacks on the South Shore. If you have kids, nothing beats IHOP for stress management. 5. Inform your neighbors of your move and make sure that the elevators are available, and that there’s enough parking space for the moving truck. Some neighborhoods require a pre-arranged street occupancy permit. Using a professional mover, such as the trusted partner companies we use for you when we at Discount Packing Supplies arrange your move, means that stress of permits and other official arrangements is not all on your shoulders. Save yourself even more stress and take advantage of our free relocation management services to plan your whole move. 6. Keep a copy of your mover’s certificate of insurance accessible, even if you already submitted it to the managing agent or the super of your new building. 7. Pack a survival bag with your medications, changes of clothes, snacks, toothbrushes and toothpaste. Keep the bags on your person. 8. Charge up your cell phone before you move. Make sure your charger for it is not in the boxes that just went into the moving van! 9. Purchase a small amount of touch-up paint and wall filler, so you can repair any minor damage caused by your movers. Keep a broom and dustpan available and sweep up after the loading phase. Although this is technically not “your job,” if you ever move again, you will need good references. 10. Create good vibes by offering your movers water and snacks. 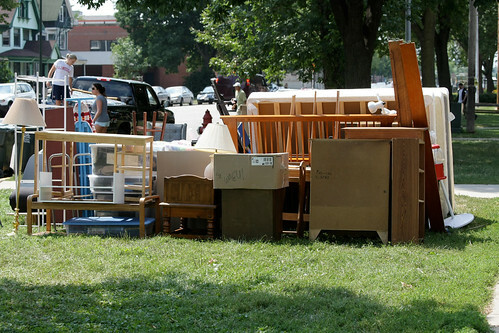 If moving is so stressful, why do we do it? Our research shows that, overwhelmingly, we move for positive reasons: to start a family or a new job; to live on our own, be closer to work or retire; to have a yard for a dog. When the tasks associated with the move start to seem unbearable, take a deep breath and remember why you’re moving. This alone will reduce stress.